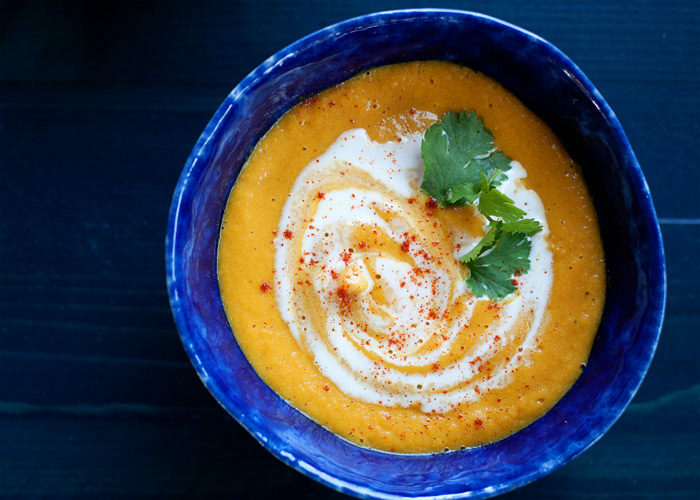 Love this souper – err, super – simple recipe! 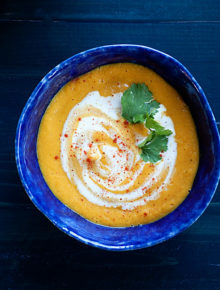 Sweet carrots, aromatic curry spices, a bite of ginger, all pureed with red lentils for a creamy and hearty soup that’s on the table in minutes. What’s better than delicious homemade soup? Actually, add “simple” to that, too. Simple, easy, delicious homemade soup. That’s what we have right here! First, let’s talk about the delicious part. 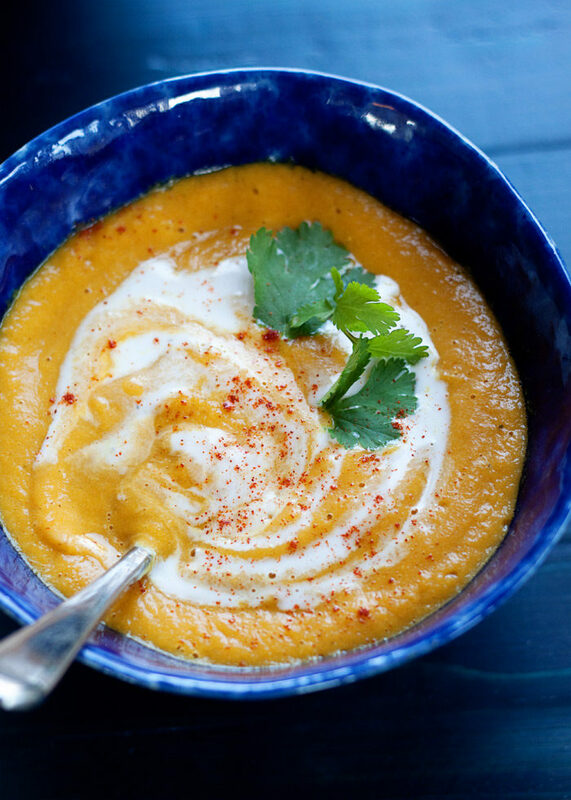 Carrots and ginger, friends, all pureed up in a creamy soup. Need I say more? Okay, I’ll say a more because I’m me. 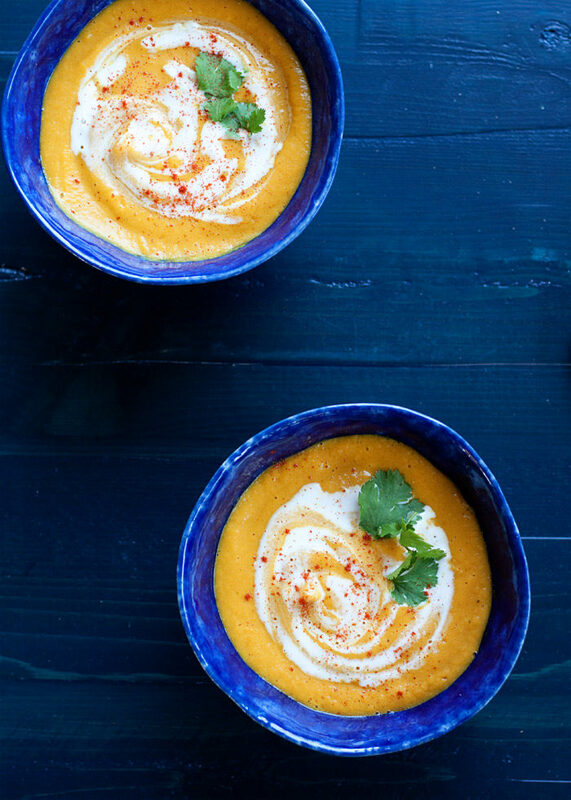 I adore this carrot ginger soup, and this Instant Pot Curried Carrot Lentil Soup is a spin-off of that one. For this recipe, I added red lentils for protein and nutrition, plus a good amount of curry powder for loads of flavor. Simple? Check check. This recipe calls for only 9 ingredients – and that’s if you include the olive oil, salt, and pepper. I love simple soup recipes like this one – especially when the complex flavor makes it taste like you used way more than the handful of ingredients you did. Simple, easy, delicious, creamy carrot-lentil soup, right in the Instant Pot. And right in my belly. Love this Instant Pot red lentil soup. Hit the “Saute” button on your Instant Pot. Add olive oil. When hot, add the onions. Saute until transluscent, about 5 minutes. 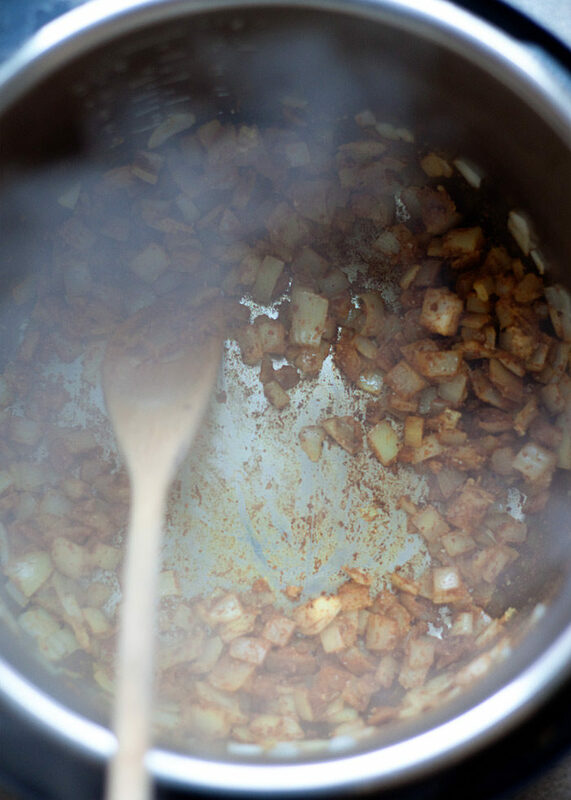 Add the ginger and curry powder and cook, stirring, until aromatic, about 30 seconds. Add the carrots, broth, lentils, 1 teaspoon salt, and 1/4 teaspoon pepper. Stir to combine. Place the lid on the Instant Pot and make sure the release valve is in the “sealing” position. Press the “Manual” button and set the timer for 10 minutes. The Instant Pot take about 10 minutes to warm up and then will start cooking. After the 10 minutes is up, quick-release by flipping the release valve to “venting” – a little at a time at first. Once venting is complete, remove the Instant Pot lid. Let cool for a few minutes, then puree. You can either use a stick blender (also known as an immersion blender) or puree in batches in the blender. Taste and add additional salt and pepper if desired. Ladle into bowls, garnish if desired, and serve. Recipe cook time includes saute time and Instant Pot warm-up time of about 10 minutes. Loved this simple and delicious soup. I used coconut oil which added a pleasant complexity to the the overall taste. Garnished with yogurt and julienned kale. 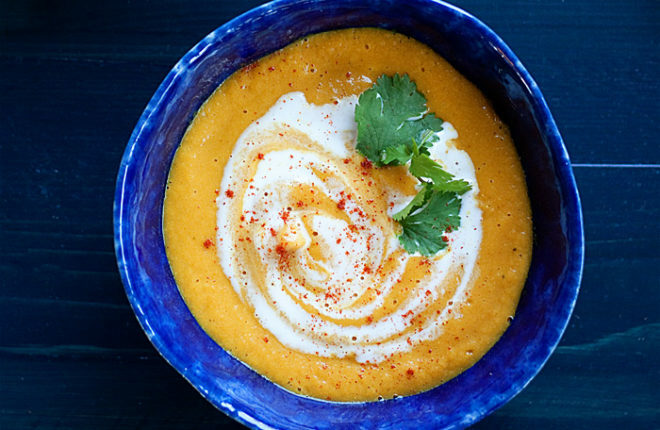 Thank you for sharing this awesome and versatile soup. This looks delicious! May I ask what size instant pot you use? I received a mini duo 3 qt one for the holidays and am not quite sure what recipes will fit. Thank you. Happy New Year! This was so good. There were no reviews so i was a bit hesitant but i think I went with it because i needed to make something quick.. and WOW. It was really good stuff! I used curry powder that’s a bit on the spicy side so it came out spicy but I still liked it. After our family finished off the pot for lunch I immediate made another batch, but 1.5 times the recipe which yielded 1qt jar (which i gave to a friend) and 4pint jars for my husband’s lunch. We had it with crispy sour dough bread on the side. Thank you for this great recipe. This is going into our family recipe binder. One question: i was kinda surprised that there were no garlic in this recipe, .. would that make a difference? Thank you so much! Would you like to add a star review so that others know you liked it? Let me know how many stars! 🙂 Garlic would probably be great added to the mix! Sometimes I err on the side of less ingredients in a recipe and if I love it then I figure it’s just fine without. But if you decide to try it with the garlic please report back! I pretty much followed the recipe except that I added some spinach we needed to use to the blender (we have a Vitamix). This soup was so delicious! The curry and ginger added the right amount of punch. I will make this again–a great recipe for the Instant Pot! So glad you liked it! It’s a favorite here too. I love that you added spinach. Delicious! (I had tried a cashew recipe that was too heavy but this was perfect.) Thanks! Wonderful. I’m loving my Instant Pot and it is nice to find a recipe for what you have in the fridge at that moment. Have to admit, added a little crème fraīche to the cilantro and spices. Perfect! So glad you like it – thank you for the review! Crème fraīche sounds like an incredible addition. How many weight watchers points is this? I am new to the Instant Pot and was looking for an easy and flavorful red lentil soup recipe. This fit the bill perfectly. I followed the direction exactly and used my immersion blender at the end and it was fantastic. This will be on my regular rotation. Can’t wait to check out some of your other recipes. This is a delicious recipe!! I add some fresh or dried turmeric, otherwise follow the recipe as is. Yay! So glad you like this one. It’s a fave here! It’s cooling waiting to get blended, smells fabulous. Not near as much volume as I expected. I made 1.5 times the recipe because a 1 pound bag of carrots gave me 3 cups and my sm/med onion gave me 1.5 cups so I ran with it. It’s not blended yet, but it is only 6 cups and the lentils have all but disappeared already. I used split red lentils as the only whole red lentils came in a 6 pound bag and there is only 2 of us and I don’t know how else to use them. The splits came in a 2 pound bag so I need to either make more soup or find another use because we still have plenty. Wondering if this might be why it is lower volume. If I want to add coconut milk, when do I do that? Can I just add it at the end? I just want a splash to make it a little rich. This soup is incredible. So simple and so delicious. I added a little coconut milk at the end (about 1/3 c). I let it cool and then blended in my ninja blender (2 batches). It came out so creamy and delicious. I actually immediately made a second batch in my instant pot because I knew 1 wouldn’t be enough for our large family. This is a wonderful gift for someone who has just had a baby or is sick. It’s vegan so it suits everyone. I will be using this recipe for years to come. Thank you! Love the coconut milk addition. I’m so glad you like the recipe! Wow! This turned out super well. In fact, it tasted like something you’d order from a Thai restaurant. I didn’t have curry powder so used a teaspoon of turmeric, cumin, coriander and garlic powder instead. I also threw in a chunk of creamed coconut before blending. Thanks! Sounds delicious! I’ll have to try the creamed coconut. Wow. I am not going to lie I did not expect this soup turn out as good as it did. This soup is SO delicious. The easiest thing I’ve ever, can’t believe I made something that tastes this good =‘) thanks so much for this recipe I will be making this again for sure. I’m so glad you liked it! Thank you so much for the review. I’m so glad you liked it! I’ll have to make it again and double check the salt. I try to go with less rather than more then suggest adding more to taste at the end because I know everyones’ tastes vary and I tend to like things on the salty side! 🙂 Thanks so much for the review. This soup was delicious! So simple and flavorful. My 4 year old even asked for seconds! I’m so glad you liked it! I love that your 4-year-old liked it. Mine won’t touch ANY soup with a 10-foot pole. She is missing out! This was DELICIOUS! I was looking for something easy to make to lunches this week and stumbled across this recipe. Really easy, full of veggies and tastes amazing. I added spinach and a can of coconut milk after it was done cooking and before I blended it. Definitely a keeper.